I often get asked by parents who want to know how to encourage your kids to ride a bike. I was alarmed to read a few statistics in a great media release from We Ride Australia (formerly the Cycling Promotion Fund). There’s been a 42 per cent decline in active travel to school from 1971 to 2013. Sales of kid’s bikes has dropped to a ten year low, dropping about 22 per cent over a ten year period. So how do you get your kids to get off their devices and ride a bike. Here’s a few tips….. There are a number of stages for kids to ride bikes. The first stage is when children can’t actually ride independently, the second is when they start to ride alongside you but still need constant supervision, and the third is when they can ride on their own. There are a number of options available for you to transport your children at quite a young age including baby seats and trailers. You need to wait until your baby is strong enough to sit independently, has strong head control, and can fit into a child’s cycling helmet (and keep it on!). As a result, it’s best to wait till they’re about a year old. Baby seats can be fitted to a bike on either the front (just behind the handlebars) or at the rear of the bike (on a dedicated rack). There are some limitations for fitting baby seats on particularly bikes and rear ones are more popular because they don’t impede your riding as much. Trailers that you tow behind your bike are another option and can seat one or two children but your children are much further away from you, and close to the ground which some parents are not comfortable with. As they get older you can also consider tag-alongs which allow your child to ride behind you but firmly attached to the bike. If you want your children to be confident riders then you should start them early. Balance bikes which are small bikes with no cranks or pedals allow children to learn to balance and steer and use their feet to scoot along. They also allow an easy transition to a bike with pedals and cranks and no training wheels. You probably wouldn’t try an actual family bike ride when your child is on a balance bike but they are great for kids to ride around the backyard or a safe location under supervision so they can learn about riding. Once your children are ready to ride alongside you confidently without training wheels on their bike find a safe location like a park with dedicated cycle paths. You can legally ride on any footpath with children under the age of 12 but it is not recommended in busy areas where there is a lot of pedestrian traffic. It can, however, be a great way to get to a park with dedicated cycle paths. When you first start riding with your children keep rides relatively short and include a destination like a café or ice cream shop so they get a reward for their hard work. Kids get bored and are easily distracted which can be a dangerous combination. Watch out for kids losing interest. Stay close to them and stop for plenty of breaks to keep up their enthusiasm. When you first start riding make sure your kids ride in front of you. This is particularly important if you’re riding on the road with them. Cars approaching from behind will have an easier time seeing you and you can give your children some warning when a big truck or noisy car is coming. Riding behind your child will also give you an opportunity to make sure your family stays together and that your child is riding appropriately and obeying the rules of the road. Make your children aware that most off-road bike paths are shared with pedestrians, and teach them to signal with their bell. Be on the lookout for other cyclists as well and do your best to help your kids be aware too. Communicate any hazards you see with them and get them to pull over to the side if necessary. If you want to ride regularly with your family then you need to get set up. You’ll need suitable bikes in good working order and you’ll need to maintain them by checking tyre pressure regularly and getting them serviced at your local bike shop. The type of bikes will vary according to the terrain. 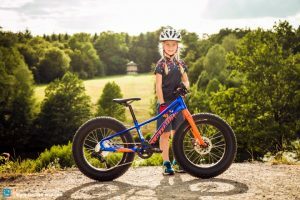 For example, if there are hills involved in the bike rides you intend to undertake, then you’ll need gears on both yours and your children’s bikes so they can ride up the hills with ease. You’ll also need a bike rack fitted to your car if you intend to drive to suitable locations for your family bike rides. If you’re lucky enough to live in an area where you can ride from home then this might not be necessary but it’s a good idea to drive to a location when you first start your family adventures. Ask your local bike shop for advice on supplies you’ll need like spare inner tubes if you or any of the family’s bikes get a flat, tyres levers, a good quality pump, drink bottle cages and more. Above all else you should focus on the fun part of bike riding, and make it a regular family activity so that your kids are enthusiastic. What are your tips to encourage your kids to ride a bike? Share via comments or the Women Who Cycle Facebook page.